Deal to move forward on $14 billion stopgap measure falls short, possibly dooming GM and Chrysler to bankruptcy. The dramatic late-night developments could doom General Motors (GM, Fortune 500) to a bankruptcy and closure in the coming weeks, with Chrysler LLC potentially following close behind. While Ford Motor (F, Fortune 500) has more cash on hand to avoid an immediate crisis, its production could be disrupted by problems in the supplier base, as could the production of overseas automakers with U.S. plants such as Toyota Motor (TM) and Honda Motor (HMC). Investors around the world reacted negatively. Stocks closed lower in Japan and Hong Kong and were trading down in Europe. U.S. stock futures were down sharply. General Motors was trading 34% lower and Ford 11% in premarket trading. Chrysler is privately held. 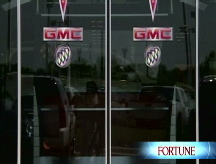 GM and Chrysler said in statements that they were disappointed but did not reveal their next moves. "We will assess all of our options to continue our restructuring and to obtain the means to weather the current economic crisis," according to the GM statement. GM has continually said it could not continue to operate if it is forced to file for bankruptcy. In response to reports that the company has hired a prominent bankruptcy attorney, GM said its board "is meeting frequently and monitoring the situation very closely and is committed to considering all options -- as is management -- and has engaged appropriate advisors for all contingencies." The White House has been strongly opposed to using any of the $700 billion in bank bailout funds to help the auto industry, but the Bush administration has also said the Big Three must get some financial assistance soon. "It's disappointing that Congress failed to act last night," said White House Deputy Press Secretary Tony Fratto. "We will evaluate our options in light of the breakdown in Congress." The measure the Senate turned back would have provided $14 billion in federal loans as a stopgap measure until the new Congress and the incoming Obama administration could reach a longer-term solution. While the package was far less than the $34 billion requested by the automakers earlier this month, it would have seen them through their current cash crisis. GM has said it needs $4 billion by the end of the month or its cash reserves will fall below the level it needs to continue operations. It needs another $6 billion in the first two months of 2009, according to its request to Congress. Chrysler had said its cash would run out early next year and it would need $4 billion in the first quarter to continue operations. Earlier in the evening, it appeared that the two sides were getting close to an agreement on the bailout. But just after 10 p.m., Senate Majority Leader Harry Reid, D-Nev., announced a failure to reach an agreement and that he would call for a procedural vote to test support for the measure. "We have worked and worked and we can spend all night tonight, tomorrow, Saturday, and Sunday, and we're not going to get to the finish line," Reid said on the Senate floor before the vote. "That's just the way it is. There's too much difference between the two sides." Senate Minority Leader Mitch McConnell, R-Ky., said the sticking point was the United Auto Workers union's refusal to put employees at U.S. auto manufacturers at "parity pay" with U.S. employees at nonunion plants operated by foreign automakers in the United States. Negotiations centered around proposals from Sen. Bob Corker, R-Tenn., that would have set dates in 2009 by which the automakers receiving the loans had to reach cost cutting agreements with unions and creditors or be forced into bankruptcy. Corker said the two sides were very close to a deal and stumbled on the deadline for the union to agree to the reduced pay. "We are about three words away from a deal," Corker said. Currently, analysts estimate the union workers at U.S. automakers make about $3 to $4 per hour more than the non-union U.S. employees of foreign automakers like Toyota and Honda, according to the Center for Automotive Research. The benefit costs are significantly greater for U.S. automakers, though, because they have to pay health care costs for hundreds of thousands of retirees. The union agreed to close much of that gap in the 2007 labor agreements by shifting responsibility for retiree health care to union-controlled trust funds. But those changes won't take effect until 2010. The House easily passed the bailout bill Wednesday night but it quickly ran into trouble in the Senate, where Republicans objected to several provisions.